We know that every bingo game has different requirements and one set of equipment cannot meet the needs of every game and every hall. 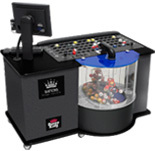 We carry the variety you need in bingo equipment that's right for your hall to make it a success! "Providing Proactive Solutions Through Quality Service and Support"